Cover artwork: Adaptation of the cover illustration for Homage to Paderewski (Boosey & Hawkes, 1942). Following the resounding success of Jonathan Plowright’s 2010 Hommage à Chopin, the acclaimed British pianist becomes the first artist to record the album of works written and published in homage to one of the early twentieth century’s most fascinating figures, Polish pianist, composer and politician Ignacy Jan Paderewski. Of the twenty-two works on this recording, from composers including Bartók, Martinu and Milhaud, seventeen were intended for the memorial piano album Homage to Paderewski published by Boosey & Hawkes in New York in 1942. A further six pieces written for the pianist also feature, including a Mazurka for two pianos by Britten, for which Plowright is joined by Aaron Shorr. Plowright performs these diverse works with flair and dedication. A man of many titles in both the world of politics and music, Ignacy Jan Paderewski (1860–1941) was one of the human wonders of the late nineteenth and first half of the twentieth centuries. Presidents and kings, generals and statesmen, as well as millions of freedom- and music-loving people, fell under the spell of his impassioned pleas for an independent Poland or succumbed to his magical renditions of Chopin. The inspiration for creating this Homage to Paderewski came from an album of piano music bearing the same title published by Boosey & Hawkes in 1942. 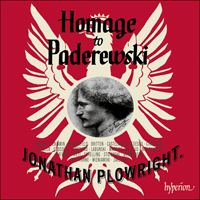 Originally intended to celebrate the golden jubilee of Paderewski’s first American concert tour of 1891, his untimely death on 29 June 1941 caused a delay in publication, and the volume was then released in memoriam to mark his passing. Of the twenty-two pieces written by twenty-one composers on this recording, seventeen were intended for the memorial piano album. The pieces recorded here that were not written for the original printed anthology include those by Schelling, Wieniawski, Zarzycki, Chaminade and Blumenfeld—although like the works from the 1942 publication, each of these pieces was also dedicated to Paderewski. The anthology’s editor, music librarian Dorothy Lawton, was responsible for contacting the composers, all living in North America, to contribute to the collection. There were only three native-born Americans in this group: Chanler, Schelling and Whithorne. Some of the composers emigrated to the USA before World War II, including Stojowski, Hammond and Labunski, while Arthur Benjamin, Britten and Goossens were in either the USA or Canada at the outbreak of the war. The remaining composers were either self-exiled musicians such as Bartók, Nin-Culmell and Martinu, who were fleeing the rule of Nazi oppression and the eventual destruction of their homelands, or Jewish musicians such as Castelnuovo-Tedesco, Rieti, Milhaud, Rathaus and Weinberger, seeking refuge from the Holocaust. These composers—along with many other famous European composers who also settled in the USA during the 1940s, including Hindemith, Schoenberg, Stravinsky and Weill—paved the way for America to become an international leader in new trends in Western music following World War II. Józef Wieniawski was the younger brother of the more famous violinist/composer Henryk. Like his brother, he was born in Lublin and studied in Paris where he took first prize in piano at the Paris Conservatory at the age of twelve in 1849. He settled in Warsaw and became the second director of the Warsaw Musical Society until in his later life he moved to Brussels to teach at the conservatory. Wieniawski’s music was once described by one of his contemporaries as being ‘full of original ideas’, but at the same time ‘dry and pensive’. His Étude Op 44 No 22 is virtuosic and Chopinesque. The 1942 Boosey & Hawkes publication opens with the Three Hungarian Folk-Tunes Sz66 (BB80b) by Béla Bartók, which were composed many years before the commission, in 1914–18. The Hungarian characteristics of these pieces include the use of modal melodies based on the Mixolydian and Dorian scales and frequent melodic leaps of the fourth as found in the last two folksongs. Arthur Benjamin, Australian-born and British-trained, was living in Vancouver at the beginning of World War II. He had been one of Britten’s teachers at the Royal College of Music in London. His Elegiac Mazurka is dominated by this dance’s trademark dotted rhythm, which is used with dramatic effect. Best remembered for his art songs, Theodore Chanler studied with Ernest Bloch in Cleveland and Boulanger in Paris. His Aftermath is a romantic gem, lyrical and soothing. A Polish immigrant, Felix Labunski relocated to America in 1936 and settled in Cincinnati. He was especially indebted to Paderewski, who, following their meeting in Paris in 1928, funded the remainder of his studies with Dukas and Boulanger. In addition to his Threnody, a very intense piece with a beautiful cantabile middle section, Labunski also dedicated a symphonic poem entitled In memoriam to his mentor. Born in Italy, Mario Castelnuovo-Tedesco settled in California where he composed the music to some 250 Hollywood films. His musical tribute Hommage à Paderewski is a sweet mazurka with a strange cadenza-like passage before the end. British-born and educated, a composer as well as a conductor, Eugene Goossens was working as conductor of the Cincinnati Symphony Orchestra in Ohio at the outbreak of World War II. Goossens’ Homage is based on Chopin’s Prelude in C minor. Richard Hammond moved from England to America during World War I, graduated from Yale and eventually settled in Los Angeles near Igor Stravinsky, one of his closest friends during the 1940s and 1950s. Hammond’s Dance, a rhythmic and exuberant work in mixed metres, provides a welcome contrast to the sombre and sobering piece of Goossens that precedes it. The French composer Darius Milhaud emigrated to the USA in 1941. His contribution to the piano album was a Choral in 5/4 metre. Harmonically, the hymn is polytonal with the two hands playing simultaneously in different keys. Bohuslav Martinu also composed a mazurka for the memorial volume; this one is in ABA form with the outer sections marked Moderato poco andante and the middle section marked Poco vivo. The prolific Czech composer arrived in America in 1941 and settled in New York until he returned to Europe in 1956. Born in Berlin of Cuban ancestry, Joaquín Nin-Culmell moved to the USA in 1939. He was a prolific composer for the guitar, writing some 100 pieces. In Memoriam Paderewski is another short mazurka, and Nin-Culmell adds a bit of Latin American flavour by the use of syncopation in the second half of the piece. This is achieved by the right hand playing in 3/4 while the left hand simultaneously plays in 6/8. A native of Cleveland, Emerson Whithorne studied in Europe, including the piano with Leschetizky, who had also been Paderewski’s teacher. At some point following his return to the USA in 1915 he gave composition lessons to Richard Hammond, composer of the Dance found earlier in the volume. Hammond and Whithorne cofounded the Composers’ Music Corporation in New York, specializing in publishing the scores of contemporary composers. Most of Whithorne’s Hommage is written on four staves. Marked Lento, the theme of this piece is based on a rhythmic motif that incorporates a triplet figure which dominates the opening and closing sections of the work. The solemn, slow-moving pace creates a depressed mood. Born in Egypt, the Italian Vittorio Rieti studied with Respighi. He went to the USA in 1940 and settled in New York. The delightful and sparkling Allegro danzante breaks the spirit of mourning created by Whithorne’s piece. Neoclassical in style, one can hear echoes of Scarlatti in this dance. Rieti’s frequent pianistic punctuations played in octaves by both hands also remind the listener of Paderewski’s own Caprice from his Humoresques de concert, Op 14. Born in Tarnopol (now Ternopil, Ukraine), Karol Rathaus received his musical training in Berlin and Vienna. In 1938 the composer moved to New York where he spent the rest of his life. Neoclassical in style, Rathaus’s Kujawiak (a Polish dance in triple metre) is characterized by its highly chromatic and sinuous melody. Like Schelling, Sigismond Stojowski had the distinction of being one of the few pianists to have studied with Paderewski over a long period of time. Zygmunt, as he was called in Polish, studied in Cracow and Paris. He moved to New York in 1905 to be on the founding faculty of the Institute of Musical Art. Stojowski’s Cradle Song is a Spanish-American berceuse based on the lullaby Alarroro rito which Stojowski learned from his Peruvian wife, Luisa. In fact, it was thanks to Paderewski that Zygmunt and Luisa first met. Jaromír Weinberger was born in Prague, and fled his native country for America in 1939. In his Étude in G major the composer incorporates a Polish patriotic hymn of the nineteenth century, Z dymem pozarów (‘From the smoke of fires’), and provides the pianist with an extraordinary tour de force. The same melody was used by Edward Elgar in his symphonic prelude Polonia, dedicated to Paderewski during World War I.
Benjamin Britten misunderstood the commission and composed a work, entitled Mazurka elegiaca, scored for two pianos, instead of writing one for solo piano. Thus although it was intended for the volume it had to be published separately. Britten captures the melancholy characteristic of so many of Chopin’s mazurkas, thereby saluting Paderewski as the great Chopin interpreter. Aleksander Zarzycki was born in Lwów (now Lviv, Ukraine), studied in Berlin and Paris, and settled in Warsaw. He was a co-founder and the first director of the Warsaw Musical Society as well as the choir conductor at St John’s Archcathedral where Paderewski’s remains are entombed in the crypt. French in flavour, the Chant du printemps is a typical morceau de salon. Following a programmatic-like introduction of springtime nymphs welcoming the listener on their harps, a beautiful melody reminiscent of Mendelssohn’s Songs without Words takes over. Cécile Chaminade studied in Paris with several teachers, including the composer Benjamin Godard. Although a prolific composer, her music (in common with that of several other composers on this recording) has fallen into obscurity. In 1913 she became the first woman composer to be awarded the Légion d’honneur. Although the title Étude symphonique is reminiscent of Schumann, the music begins in the style of a Chopin nocturne, and then alternates between the lyrical (Andante) and dramatic (Allegro appassionato) in a manner characteristic of the Romantic period. Homme bardé de titres en politique comme en musique, Ignacy Jan Paderewski (1860–1941) fut une des merveilles du genre humain de la fin du XIXe siècle et de la première moitié du XXe siècle. Des présidents et des rois, des généraux et des hommes d’État, mais aussi des millions de gens épris de liberté et de musique tombèrent sous le charme de ses vibrantes suppliques pour une Pologne indépendante ou succombèrent à ses magiques interprétations de Chopin. Cet Hommage à Paderewski nous a été inspiré par un album de musique pianistique publié, sous le même titre, par Boosey & Hawkes, en 1942. D’abord destiné à célébrer le cinquantième anniversaire de la première tournée américaine de Paderewski, en 1891, il vit sa parution retardée par la mort inattendue du compositeur, le 29 juin 1941; il fut finalement publié in memoriam, pour marquer sa disparition. Sur les vingt-deux pièces réunies ici, émanant de vingt et un compositeurs, dix-sept furent conçues pour l’album commémoratif de 1942, les cinq autres étant celles de Schelling, Wieniawski, Zarzycki, Chaminade et Blumenfeld—mais toutes, sans exception, sont dédiées à Paderewski. L’éditrice de l’anthologie originale, la bibliothécaire musicale Dorothy Lawton, fut chargée de contacter les compositeurs, vivant tous en Amérique du Nord, en vue d’obtenir leur contribution. Parmi eux se trouvaient trois Américains de naissance: Chanler, Schelling et Whithorne. D’autres avaient émigré aux États-Unis avant la Seconde Guerre mondiale (ainsi Stojowski, Hammond et Labunski), tandis qu’Arthur Benjamin, Britten et Goossens se trouvaient aux États-Unis ou au Canada quand la guerre éclata. Pour le reste, il s’agissait soit de musiciens qui s’étaient exilés pour fuir l’oppression nazie et la destruction de leur patrie (Bartók, Nin-Culmell ou encore Martinu), soit de musiciens juifs (tels Castelnuovo-Tedesco, Rieti, Milhaud, Rathaus et Weinberger) cherchant asile pour échapper à l’Holocauste. Tous ces compositeurs—comme maints autres européens célèbres, émigrés aux États-Unis dans les années 1940 (Hindemith, Schoenberg, Stravinski ou encore Weill)—pavèrent la voie à une Amérique bientôt fer de lance des nouveaux courants qui marquèrent la musique occidentale de l’après-guerre. Józef Wieniawski était moins connu que son frère aîné Henryk, illustre violoniste-compositeur. Né comme lui à Lublin, il étudia à Paris, où il remporta le premier prix de piano au Conservatoire en 1849, à l’âge de douze ans. Il s’installa ensuite à Varsovie, dont il devint le deuxième directeur de la Société musicale; vers la fin de sa vie, il emménagea à Bruxelles pour enseigner au Conservatoire. De sa musique, l’un de ses contemporains dit qu’elle était ensemble «pleine d’idées originales» et «sèche et pensive». Son Étude op. 44 no22 est virtuose et chopinesque. Le volume Boosey & Hawkes s’ouvre sur les Trois airs folkloriques hongrois Sz66 (BB80b) de Béla Bartók, composés en 1914–18, bien avant la commande de 1941. Parmi les hungarismes de ces pièces, citons l’usage de mélodies modales fondées sur les gammes mixolydienne et dorienne, ainsi que de fréquents sauts de quarte mélodiques (dans les deux derniers chants). Arthur Benjamin, né en Australie et formé en Grande-Bretagne, vivait à Vancouver au début de la Seconde Guerre mondiale. Il avait été l’un des professeurs de Britten au Royal College of Music de Londres. Son Elegiac Mazurka est dominée par le rythme pointé typique de cette danse, utilisé avec un effet saisissant. Surtout connu pour ses chansons savantes, Theodore Chanler étudia avec Ernest Bloch à Cleveland et avec Boulanger à Paris. Son Aftermath est un bijou romantique, lyrique et apaisant. Immigré polonais, Felix Labunski déménagea aux États-Unis en 1936 et choisit la ville de Cincinnati. Il était particulièrement redevable à Paderewski qui, suite à leur rencontre parisienne en 1928, avait financé la fin de ses études avec Dukas et Boulanger. Outre sa Threnody, pièce fort intense douée d’une splendide section centrale cantabile, il dédia à son mentor un poème symphonique intitulé In memoriam. Né en Italie, Mario Castelnuovo-Tedesco s’installa en Californie, où il signa la musique de quelque deux cent cinquante films hollywoodiens. Son Hommage à Paderewski est une tendre mazurka dotée d’un singulier passage façon cadenza, vers la fin. Né et éduqué en Grande-Bretagne, le compositeur et chef d’orchestre Eugene Goossens dirigeait le Cincinnati Symphony Orchestra, dans l’Ohio, quand éclata la Seconde Guerre mondiale. Son Homage repose sur le Prélude en ut mineur de Chopin. Émigré d’Angleterre en Amérique pendant la Première Guerre mondiale, Richard Hammond, son diplôme de Yale en poche, s’installa finalement à Los Angeles, près d’Igor Stravinski, qui fut l’un de ses plus proches amis dans les années 1940 et 1950. Sa Danse, pièce rythmique et exubérante en mètres mixtes, offre un contraste bienvenu avec la noirceur et la sobriété du morceau précédent. Émigré aux États-Unis en 1941, le Français Darius Milhaud pourvut à l’album par un Choral à 5/4. Harmoniquement, l’hymne est polytonal, avec les deux mains jouant simultanément dans une tonalité différente. Comme d’autres, Bohuslav Martinu écrivit une mazurka pour le volume commémoratif; elle est de forme ABA, avec les sections extrêmes marquées Moderato poco andante et la section médiane marquée Poco vivo. Arrivé en Amérique en 1941, ce prolifique compositeur tchèque vécut à New York jusqu’en 1956, date de son retour en Europe. Compositeur d’ascendance cubaine né à Berlin, Joaquín Nin-Culmell, émigré aux États-Unis en 1939, écrivit énormément pour la guitare—une centaine de pièces. In Memoriam Paderewski est, là encore, une courte mazurka, rendue légèrement latino-américaine par le recours à la syncope, dans la seconde moitié de l’œuvre. La main droite joue alors à 3/4 pendant que la gauche joue à 6/8. Natif de Cleveland, Emerson Whithorne fut formé en Europe, où il étudia notamment le piano avec Leschetizky, le maître de Paderewski. De retour aux États-Unis en 1915, il enseigna la composition à Richard Hammond, auteur de la Danse également proposée ici. Ensemble, Hammond et Whithorne fondèrent la Composers’ Music Corporation à New York, une structure spécialisée dans l’édition de partitions de musique contemporaine. L’Hommage de Whithorne est, pour l’essentiel, écrit sur quatre portées. Son thème, marqué Lento, est fondé sur un motif rythmique incluant une figure de triolets qui domine les sections extrêmes de la composition. Le rythme solennel, à pas lents, crée un climat abattu. Né en Égypte, l’Italien Vittorio Rieti étudia avec Respighi. Il émigra aux États-Unis en 1940 et s’installa à New York. Son Allegro danzante, charmant et étincelant, rompt l’endeuillement suscité par l’œuvre de Whithorne. De style néoclassique, il présente des échos scarlattiens. Quant aux fréquentes ponctuations pianistiques exécutées en octaves aux deux mains, elles rappellent le Caprice des Humoresques de concert op. 14 de Paderewski. Né à Tarnopol (l’actuelle Ternopil ukrainienne), Karol Rathaus reçut sa formation musicale à Berlin et à Vienne. En 1938, il gagna New York où il passa le restant de ses jours. De style néoclassique, sa Kujawiak (une danse polonaise ternaire) est marquée par une mélodie extrêmement chromatique et flexueuse. Comme Schelling, Sigismond Stojowski fut parmi les rares pianistes à avoir eu le privilège de longuement étudier avec Paderewski. Après avoir étudié à Cracovie et à Paris, Zygmunt, de son prénom polonais, partit en 1905 à New York, où il intégra la faculté de l’Institute of Musical Arts. Son Cradle Song est une berceuse hispano-américaine fondée sur Alarroro rito, une berceuse qu’il tenait de Luisa, son épouse péruvienne, d’ailleurs rencontrée grâce à Paderewski. En 1939, le Pragois Jaromír Weinberger fuit sa terre natale pour l’Amérique. Dans son Étude en sol majeur, il incorpore un hymne patriotique polonais du XIXe siècle, Z dymem pozarów («De la fumée des feux»), et propose au pianiste un extraordinaire tour de force. Edward Elgar utilisa cette même mélodie dans le prélude symphonique Polonia qu’il dédia à Paderewski lors de la Première Guerre mondiale. Se méprenant sur la commande, Benjamin Britten composa non une œuvre pour piano solo mais une Mazurka elegiaca pour deux pianos, qu’il fallut donc publier à part. Il y appréhende la mélancolie propre à tant de mazurkas chopiniennes, saluant ainsi le grand interprète de Chopin qu’avait été Paderewski. Né à Lwów (l’actuelle Lviv ukrainienne), Aleksander Zarzycki étudia à Berlin et à Paris avant de s’installer à Varsovie. Co-fondateur et premier directeur de la Société musicale de cette ville, il dirigea aussi le chœur de la cathédrale Saint-Jean, dont la crypte renferme la dépouille de Paderewski. De saveur française, son Chant du printemps est un morceau de salon typique. Passé une introduction programmatique de nymphes printanières accueillant l’auditeur avec leurs harpes, une splendide mélodie reprend des réminiscences des Romances sans paroles de Mendelssohn. Cécile Chaminade étudia à Paris auprès de différents professeurs, dont le compositeur Benjamin Godard. Bien que prolifique, elle vit (comme plusieurs compositeurs figurant sur ce disque) sa musique sombrer dans l’oubli. En 1913, elle devint la première compositrice distinguée par la Légion d’honneur. Malgré l’écho schumannien de son titre, l’Étude symphonique part dans le style d’un nocturne chopinien avant d’adopter l’oscillation entre lyrisme (Andante) et drame (Allegro appassionato) propre à la période romantique. Ignacy Jan Paderewski (1860–1941), ein Mann mit vielen Titeln sowohl in der Welt der Politik und als auch der Musik, war einer der wunderbarsten Menschen im späten 19. und in der ersten Hälfte des 20. Jahrhunderts. Präsidenten und Könige, Generäle und Staatsmänner sowie Tausende freiheits- und musikliebender Menschen gerieten in den Bann seiner leidenschaftlichen Appelle für ein unabhängiges Polen oder erlagen dem Zauber seiner Chopin-Interpretationen. Diese Homage to Paderewski wurde durch ein Album desselben Titels mit Klaviermusik angeregt, das 1942 bei Boosey & Hawkes erschienen war. Ursprünglich war es für die Feier des goldenen Jubiläums von Paderewskis erster Konzerttournee in Amerika 1891 vorgesehen; doch sein unzeitiger Tod am 29. Juni 1941 verzögerte die Veröffentlichung, und das Album erschien dann anläßlich seines Todes in memoriam. Von den 22 Stücken dieser Aufnahme, die von 21 Komponisten stammen, waren 17 für das Gedenkalbum gedacht. Zu den hier eingespielten Stücken, die nicht für die erste gedruckte Anthologie geschrieben wurden, gehören jene von Schelling, Wieniawski, Zarzycki, Chaminade und Blumenfeld; sie waren jedoch alle, genau wie die Werke in der Ausgabe von 1942, ebenfalls Paderewski gewidmet. Die Herausgeberin der Anthologie, die Musikbibliothekarin Dorothy Lawton, war für den Kontakt mit den Komponisten verantwortlich, die alle in Nordamerika lebten und zu der Sammlung beitragen sollten. Es gab nur drei gebürtige Amerikaner in dieser Gruppe: Chanler, Schelling und Whithorne. Einige Komponisten waren vor dem Zweiten Weltkrieg in die USA eingewandert, u. a. Stojowski, Hammond und Labunski; Arthur Benjamin, Britten und Goossens hingegen hielten sich bei Kriegsausbruch in den USA beziehungsweise in Kanada auf. Die übrigen Komponisten waren entweder exilierte Musiker wie Bartók, Nin-Culmell und Martinu, die vor der Unterdrückung durch das Nazi-Regime und der späteren Zerstörung ihres jeweiligen Heimatlandes geflohen waren, oder jüdische Musiker wie Castelnuovo-Tedesco, Rieti, Milhaud, Rathaus und Weinberger, die Zuflucht vor dem Holocaust suchten. Diese Komponisten waren (zusammen mit vielen anderen berühmten Komponisten aus Europa, die sich in den 1940er Jahren ebenfalls in den USA niedergelassen hatten, u. a. Hindemith, Schönberg, Strawinsky und Weill) ausschlaggebend für die international tonangebende Rolle, die Amerika nach dem Zweiten Weltkrieg in den neuen Strömungen der westlichen Musik spielte. Józef Wieniawski war der jüngere Bruder des berühmteren Geigers und Komponisten Henryk. Wie sein Bruder wurde er in Lublin geboren und studierte in Paris, wo er 1849 mit zwölf Jahren den ersten Preis für Klavier am Pariser Conservatoire erhielt. Er lebte in Warschau und war zweiter Direktor der dortigen Musikalischen Gesellschaft, bis er später nach Brüssel ging, um am Konservatorium zu unterrichten. Über Wieniawskis Musik schrieb einer seiner Zeitgenossen einmal, sie sei „voller origineller Ideen“, doch gleichzeitig „trocken und gedankenschwer“. Seine virtuose Étude op. 44 Nr. 22 erinnert an Chopin. Das Boosey & Hawkes-Album von 1942 beginnt mit den Drei ungarischen Volksliedern Sz66 (BB80b) von Béla Bartók, die 1914–18 komponiert wurden, also lange vor dem Auftrag. Zu den ungarischen Merkmalen dieser Stücke gehören modale Melodien, die auf der mixolydischen und der dorischen Skala basieren, sowie häufige melodische Quartsprünge, z. B. in den letzten beiden Volksliedern. Der in Australien geborene und in Großbritannien ausgebildete Arthur Benjamin lebte zu Beginn des Zweiten Weltkrieges in Vancouver. Er war einer der Lehrer Brittens am Royal College of Music in London. In seiner Elegiac Mazurka dominiert der für die Mazurka typische punktierte Rhythmus, der dramatisch effektvoll eingesetzt wird. Die bekanntesten Werke von Theodore Chanler sind seine Kunstlieder. Er hat bei Ernest Bloch in Cleveland und Nadia Boulanger in Paris studiert. Sein Aftermath ist ein romantisches Juwel, lyrisch und besänftigend. Der Pole Felix Labunski wanderte 1936 nach Amerika aus und lebte in Cincinnati. Er war Paderewski ganz besonders zu Dank verpflichtet, der nach ihrer Begegnung 1928 in Paris sein weiteres Studium bei Paul Dukas und Nadia Boulanger finanziert hatte. Außer Threnody, einem sehr dichten Stück mit einem schönen cantabile-Mittelteil, widmete Labunski seinem Mentor auch eine sinfonische Dichtung mit dem Titel In memoriam. Der in Italien geborene Mario Castelnuovo-Tedesco ließ sich in Kalifornien nieder, wo er die Musik für rund 250 Hollywoodfilme schrieb. Sein musikalischer Tribut Hommage à Paderewski ist eine liebliche Mazurka mit einer seltsamen kadenzartigen Passage vor dem Schluß. Der in England geborene und ausgebildete Komponist und Dirigent Eugene Goossens war beim Ausbruch des Zweiten Weltkriegs als Dirigent des Cincinnati Symphony Orchestra in Ohio tätig. Goossens’ Homage beruht auf Chopins Prelude in c-Moll. Richard Hammond ging während des Ersten Weltkriegs von England nach Amerika, machte seinen Abschluß in Yale und lebte schließlich in Los Angeles in der Nähe von Igor Strawinsky, einem seiner engsten Freunde in den 1940er und 1950er Jahren. Hammonds Dance, ein rhythmisches, überschwengliches Werk in gemischten Metren, kontrastiert angenehm zu dem düsteren und nüchternen Stück von Goossens davor. Der französische Komponist Darius Milhaud wanderte 1941 in die USA aus. Sein Beitrag für das Klavieralbum war ein Choral im 5/4-Takt. Harmonisch ist diese Hymne polytonal, wobei beide Hände gleichzeitig jeweils in einer anderen Tonart spielen. Bohuslav Martinu komponierte ebenfalls eine Mazurka für das Gedenkalbum; die beiden äußeren Teile dieser A-B-A-Form sind Moderato poco andante, der mittlere Poco vivo überschrieben. Der produktive tschechische Komponist kam 1941 nach Amerika und lebte bis zu seiner Rückkehr nach Europa im Jahre 1956 in New York. Der in Berlin geborene Joaquín Nin-Culmell, Sohn kubanischer Eltern, ging 1939 in die USA. Er komponierte rund 100 Werke für Gitarre. In Memoriam Paderewski ist eine weitere kurze Mazurka; Nin-Culmell fügt mit der Synkopierung in der zweiten Hälfte des Stückes noch einen Hauch Lateinamerika hinzu. Die rechte Hand spielt in 3/4, die linke hingegen gleichzeitig in 6/8. Der in Cleveland geborene Emerson Whithorne studierte in Europa u. a. Klavier bei Leschetizky, der auch Paderewskis Lehrer gewesen war. Nach seiner Rückkehr in die USA 1915 gab er zeitweise Richard Hammond Kompositionsunterricht, dem Komponisten von Dance (früher im Album). Hammond und Whithorne gründeten gemeinsam die Composers’ Music Corporation in New York, wobei sie sich auf die Veröffentlichung von Musik zeitgenössischer Komponisten spezialisierten. Der größte Teil von Whithornes Hommage ist in einem Notensystem mit vier Linien geschrieben. Das Thema dieses Lento überschriebenen Stückes beruht auf einem rhythmischen Motiv mit einer Triolenfigur, die im Anfangs- und Schlußteil der Komposition dominiert. Das feierliche, langsam voranschreitende Tempo erzeugt eine bedrückte Stimmung. Der in Ägypten geborene Italiener Vittorio Rieti studierte bei Respighi. Er ging 1940 in die USA und lebte in New York. Das entzückende und spritzige Allegro danzante durchbricht die durch Whithornes Stück aufgekommene traurige Stimmung. In diesem Tanz im neoklassizistischen Stil kann man Anklänge an Scarlatti hören. Rietis zahlreiche pianistische Interpunktionen, von beiden Händen in Oktaven gespielt, erinnern den Hörer auch an Paderewskis Caprice aus seinen Humoresques de concert op. 14. Der in Tarnopol (jetzt Ternopil, Ukraine) geborene Karol Rathaus erhielt seine musikalische Ausbildung in Berlin und Wien. 1938 ging der Komponist nach New York, wo er den Rest seines Lebens verbrachte. Charakteristisch für Rathaus’ neoklassizistischen Kujawiak (ein polnischer Tanz im Tripeltakt) ist seine höchst chromatische und gewundene Melodie. Wie Schelling zeichnet sich auch Sigismond Stojowski als einer der wenigen Pianisten aus, der lange Zeit bei Paderewski studiert hat. Zygmunt, wie er auf Polnisch heißt, hat in Krakau und Paris studiert. Er ging 1905 nach New York und gehörte zu den Gründungsmitgliedern des Institute of Musical Art. Stojowskis Cradle Song ist ein spanisch-amerikanisches Wiegenlied; es basiert auf einem anderen Wiegenlied, Alarroro rito, das Stojowski durch seine peruanische Frau Luisa kennengelernt hatte. Tatsächlich war es dank Paderewski zur ersten Begegnung von Zygmunt und Luisa gekommen. Jaromír Weinberger wurde in Prag geboren und floh 1939 aus seiner Heimat nach Amerika. In seine G-Dur-Etüde fügt der Komponist eine polnische patriotische Hymne aus dem 19. Jahrhundert ein, Z dymem pozarów („Mit dem Rauch der Feuersbrünste“) und bietet dem Pianisten eine außerordentliche tour de force. Die gleiche Melodie hat Edward Elgar in seinem sinfonischen Prelude Polonia verwendet, das er Paderewski während des Ersten Weltkrieges widmete. Benjamin Britten verstand den Auftrag falsch und komponierte ein Stück mit dem Titel Mazurka elegiaca für zwei Klaviere anstelle eines Werkes für Soloklavier. Es war zwar für das Album geplant, mußte nun aber separat erscheinen. Britten fängt die Melancholie vieler Mazurken von Chopin ein und ehrt damit den großen Chopin-Interpreten Paderewski. Aleksander Zarzycki wurde in Lwów (jetzt Lviv, Ukraine) geboren, studierte in Berlin und Paris und lebte in Warschau. Er war Mitbegründer und erster Direktor der Warschauer Musikalischen Gesellschaft sowie Chordirigent an der Johannes-Kathedrale, in deren Krypta Paderewskis sterbliche Überreste begraben sind. Chant du printemps ist ein typisches morceau de salon im französischen Stil. Nach einer fast programmatischen Einleitung, in der Frühlingsnymphen den Hörer mit Harfenspiel begrüßen, folgt eine schöne Melodie, die an Mendelssohns Lieder ohne Worte erinnert. Cécile Chaminade studierte in Paris bei verschiedenen Lehrern, darunter dem Komponisten Benjamin Godard. Obgleich eine produktive Komponistin, sind ihre Werke (wie die einiger anderer Komponisten dieser Aufnahme) vergessen. 1913 wurde sie als erste Komponistin mit dem Orden der Légion d’honneur ausgezeichnet. Der Titel Étude symphonique erinnert an Schumann, doch das Stück beginnt im Stil eines Chopin-Nocturnes und schillert dann zwischen Lyrik (Andante) und Dramatik (Allegro appassionato), wie es für die romantische Epoche typisch war.